Nazareth House Apostolate Blog: What about Bob+? A NHA tribute to a great friend & priest to all! What about Bob+? A NHA tribute to a great friend & priest to all! The details of Fr. Bob Haux's passing are yet to be learned, however, the details of his life are quite clear. He is a man of many talents and he wears many hats. Yet, most of all he is a priest, an old school priest, one full of dedication and honesty: A shepherd who loves his flock. He has an expanded flock, some in the pews, some at the restaurant, some in his socializing, some within his brother policemen, everywhere and at all times, Bob+ shepherds his many flocks. Last Sunday (November 9) , Fr. Seraphim and I joined Fr. Bob at his parish in West Point, Georgia. Fr. Bob loved James and Kadijah in Sierra Leone and they loved him. Though they never personally met, they knew each other well. St. Laurence House is officially shut down in mourning for the next 3 days in honor of their beloved friend. The last Sunday we were in Freetown, Fr. Seraphim preached the Sermon that Fr. Bob had prepared so that he could feed his people from afar. It was that Sermon that led 3 people to Baptism into Christianity after hearing it! James has much to say about Fr. Bob and I will let him speak in his own post later. Without any flash, quietly hidden, Fr. 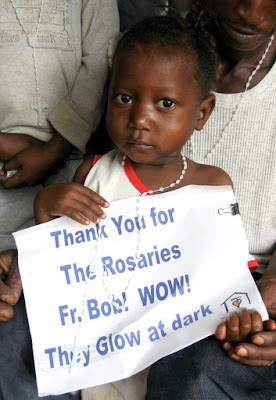 Bob became a hero in Sierra Leone. .
As we left last Sunday, Fr. Bob loaded us up with music he had put on a cd for us so that we'd have it to listen while traveling. He gave us an icon that he had written (painted) at age 17 and a folder full of his writings, etc for us to look over. We will cherish these items for ever. Pictures say a 1000 words, the ones on this blog post today show the love Fr. Bob gives and the love we all have for him. You cannot think about Bob+, without thinking of love. He gives so much. . He is always a friend... always has your back.... always a priest...always ready to love....always ready with a helping hand..